Spring is 8 days away. 8 DAYS! I've been slaving over Pinterest trying to get some outfit inspiration that doesn't require me to spend thousands of dollars. 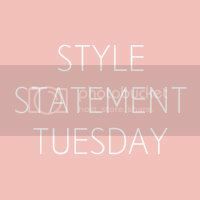 I've decided to make my finds part of Style Statement Tuesday for a few weeks. Let's see if I can replicate without looking like a d-bag, shall we? BTW, this is the second day in a row I've used "shall we" in a post. It's just my way of keeping it classy. Also, just in case you're wondering, the reason this SST post doesn't include pictures of things I actually wore is NOT because I didn't wear anything cute or remotely acceptable last week. You hear me? That is NOT why. OK, OK, maybe it is. But, just a little. So check back for the next 3 weeks to see how I made these looks my own. I'd love to see what inspires you! Link up and share your style! I'm linking up here, here, and here. I'm kind of obsessed with that first outfit!! the first outfit is amazing! i have been looking for ways to style my mint skinnies! I loooove that first look! I love the neutral paired with mint. I want to do that! Oooh I love all of those, especially the first one. Those pants are fantastic! I've seen these on Pinterest too and think they are super cute!